Ar the end of the first week's training for London, I ran eight miles early on Sunday morning to Firle Beacon and back. I had the best of the weather, though there was still a strong wind and, having run the previous evening, my legs felt tired. For some reason the outward trip was harder work than the trip home, and my legs feel it, but so they should; this is marathon training, after all. The downs looked splendid in late-December sunshine, though the Exmoor ponies were as forlorn as ever. I wonder if sugar-lumps might cheer them up or, in their absence, a gel? I ran to the sailing club on Saturday evening, for four miles. I ran to the front and back, three miles, as the sun rose. I ran five miles today in the sun. I took the High and Over route, and though that route is harder than the other five mile route I do, I felt puissant and was quite fast. Being Boxing Day, I met plenty of walkers around, all of them good-humoured, greeting me as I whizzed past. Training for London started today, as it will have done for everyone who's following a sixteen week programme, with a 4 miles slow run, after dark on Christmas Eve, down to the sea and back. I also ran Stanmer woods runs on Wednesday and Friday, in the company of various members of the BSMS runners club. I also ran last week, a cow run on Monday, and Stanmer woods runs on Wednesday and Friday, in the company of various members of the BSMS runners club. On Sunday I ran up to Firle Beacon and back and was asked by a passing horsewoman, 'aren't your knees cold?' The answer is that they weren't, although there was a strong bitingly cold wind. I rarely wear long trousers for running, only when there is snow on the ground, and on his occasion wore a t-shirt and running fleece on top. I find my upper body feels the cold far more acutely than my lower. The downs looked very Ravilious-like in the winter sun. At Firle Beacon itself, I saw the Exmoor ponies once more. They huddle together with a prehistoric air, as wild as a herd of Eohippus or Przewalski's horse. After getting lost last week, I wonder if I should be allowed to run on my own. But today was bright and I ran the cow run route, but solo, as I had to go early. The cows lowed forlornly in the winter sunshine, and underfoot the surfaces varied between frozen hardness in the shadows, and very slippery mud where the sun had thawed the ground. I had hoped to get an accurate distance for the whole route but the Garmin took a very long time, about 5 minutes of half a mile, to pick up a signal. 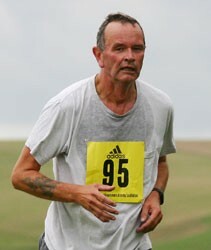 For a much better account of the Mince Pie Ten than mine, see this on RunningCommentary. I'll go for a a solitary cow run later on this frosty morning.